Just in time for seasonal cheer, Meaford has a new brewery. 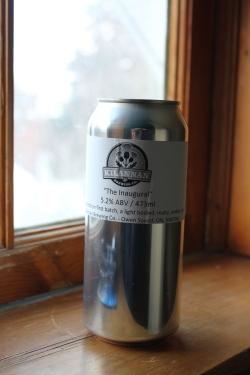 Kilannan Brewing Company introduced its first batch, fittingly called “The Inaugural”, recently – and we made a trip to the brewery in Rockford a couple of days ago for a quick tour (and taste, of course). We arrived there just in time. A few dozen silver cans, emblazoned charmingly with the peel-and-stick labels the brewer is using during the early days, were all that was left of The Inaugural. 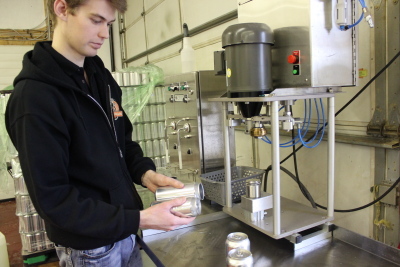 The brewer is Spencer Wareham, at 22 the youngest commercial brewer in Ontario, and probably in North America. He began brewing beer four years ago. He reached the legal drinking age in Ontario a year later. “You can buy the ingredients for brewing at 18,” he says with a laugh. 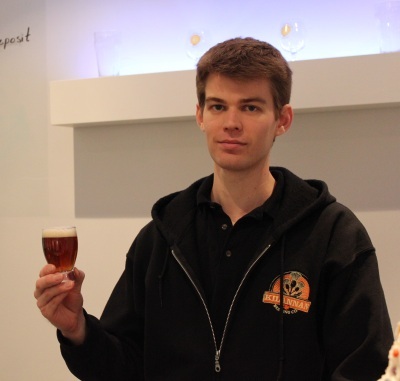 He quickly found his passion in brewing and set out to study the craft at the Siebel Institute of Technology – the oldest brewing school in the U.S. – and at the Doemens Academy in Munich, Germany. Today he has a diploma in brewing technology and his own commercial brewery. The Inaugural is an amber-coloured, light bodied, crisp beer with a mildly bitter finish. Spencer brewed it using American yeast while waiting on the German yeast he wants to make the altbier recipe he’s settled on. The second batch, in the new style, is being canned as we write. Viewing the operation, you begin to understand the term “craft brewery”. While the stainless steel brewing vats and fermentation tanks look suitably industrial, when you see the canning station, you realize what a hands-on operation it is. While some of the roughly 1200 litres produced go into kegs, most of it is packaged, one at a time, by hand at the canning station. Kilannan is named after the family farm near Annan, and Spencer’s dad is a big supporter – helping to man the shop on the day we visited. While his main recipe will be the German-style altbier, Spencer says that some day he may brew a beer using only local grains and hops. Spencer Wareham with a glass of Killannan Brewing Company’s first offering: The Inaugural. The Fall/Holiday issue of OUR HOMES Southern Georgian Bay features a group of retirees who have made this area their retirement home sweet home. One of the questions the editors asked the Georgian Bay retirees was, “Why here?” Here’s a sampling of their answers. Margaret and Norbert Pirk echoed the sentiment. “In Southern Georgian Bay we’re part of a year-round, active community with all the amenities one could desire, but close enough to Toronto for the occasional city fix,” they told the editors. Dave and Myrna Bumstead are local Meaford retirees, so choosing the area wasn’t a factor. But they do emphasize the activities they enjoy, including snowshoeing bush trails minutes from their retirement community. And Karen and Richard Pettit count golf, cycling, motorcycling, skiing, snowboarding, snowshoeing – and the arts – as enjoyable local attractions. What’s your reason? If you haven’t yet visited, it’s time to discover what your retirement lifestyle can be like. While you might dismiss this as common sense, Newsday recently reported this “startling” fact, citing a recently concluded study by researchers at the University of Western Ontario and the Yale School of Public Health. But seriously, the results suggest – as the researchers noted – that you might want to include psychological planning for retirement along with more traditional planning – such as financial planning, travel and activities. The important variable seemed to be a positive attitude toward retirement (or ATR, as the researchers dub it.) Those with a positive ATR lived a median 4.9 years longer while those with a negative ATR were 1.71 times more likely to pass away. So working on building a positive attitude toward retirement (and aging in general) is a worthwhile investment. 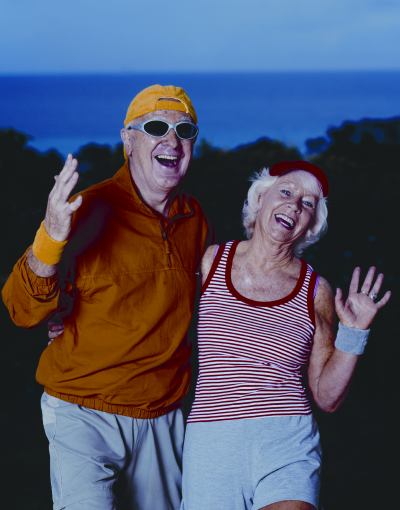 This might involve envisioning how you want to spend your retirement years, where you’d enjoy living, what activities you’d love to participate in, and what social activities you’d enjoy – and then taking steps to build these into your retirement lifestyle. The act itself can be a positive step to help you have good feelings about retirement; by planning to enjoy a meaningful and active retirement, you probably will. Back in 2007, Stephen Lewis, Canada’s former UN ambassador and the former UN special envoy for HIV/AIDS in Africa, spoke at Meaford’s United Church about the plight of grandmothers in many sub-Saharan African countries. With AIDS rampant in many countries, these women have stepped in to care for their orphaned grandchildren – sometimes caring for as many as 10 to 15 in one household. One estimate suggests that 40 to 60 percent of orphans live in grandmother-headed households. After burying their own adult children, and often with little support, they do their best to care for and raise the children. “They display astonishing reserves of love, courage and emotional resilence, even while grieving the loss of their own adult children,” says the Stephen Lewis Foundation’s website. The Foundation’s Grandmothers to Grandmothers Campaign had stepped in to provide support for these women, raising funds to invest at the community level – food, educational supplies, medical care, counselling, programs to help them become self-sufficent and more. Hearing the stories, a small group of women in the audience that day decided to start their own local fundraising chapter, and Meaford Grannies was soon an active fundraising group. Meaford Grannies holds a number of fundraisers every year, including a garage sale, plant sales, and a slient auction, and they welcome new members to help run the events. Your help to raise local funds will have a huge impact on African grandmothers in these difficult circumstances. 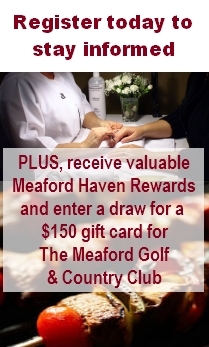 For more information, call Sandy Farrell at 519-538-4259.